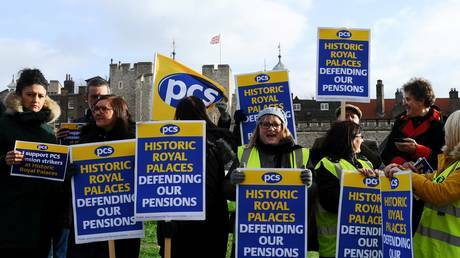 The Tower of London’s “Beefeater” guards staged a walkout in defiance of pension cuts, donning yellow vests in solidarity with French protesters as they picketed the iconic site – their first strike in 55 years. Clad in the yellow vests made famous over the past month by French protesters angered by President Emmanuel Macron’s neoliberal economic policies, the Beefeaters – along with employees of Hampton Court Palace, Kensington Palace, and other sites run by the Historic Royal Palaces group – formed a picket line outside the Tower of London after 91 percent of their union voted to strike for the first time in over half a century. Beefeaters are very dedicated to their jobs, which “enhance the image of the British monarchy,” a Historic Royal Palaces employee, who gave her name only as Theresa, told AFP. Officially called yeoman wardens, their ranks have guarded the Tower of London and the crown jewels since the 16th century. Even though their salaries are less than “marvelous,” Theresa said – and the nickname “Beefeaters” is thought to derive from having received part of their pay in beef – the great pension plan made up for it. Until now. “Young employees will lose money with this new scheme,” she warned. Michael Ainsley, regional organizer for the GMB union that includes HRP workers, called the new pension scheme part of a “race to the bottom” in which employers slash benefits and pass costs on to workers. “Today’s strike is disappointing,” said HRP Chief Executive John Barnes, adding: “It will not change our decision to close the defined benefit scheme.” He claims the strikers were offered “substantial compensation and transition arrangements” – but clearly, they were not amused.